Canada’s Rocky Mountain front harbors the richest diversity of large mammals remaining in North America. This landscape is among the continent’s last remaining undisturbed natural areas, and provides a critical transboundary linkage with the United States. Maintaining landscape connectivity throughout the ecoregion is critical for animal movement and dispersal as well as ecosystem health. At the ecoregion-scale this has occurred through integrating public and private land management. However, securing local-scale connections is equally important for making landscapes permeable for wildlife movement at a continental-scale. 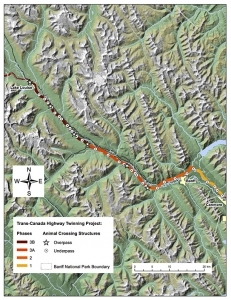 The Trans-Canada Highway (TCH) in the Canadian Rocky Mountains has long been recognized as a lethal barrier to wildlife and a potential fracture zone for population connectivity at local and landscape scales. To mitigate these impacts, during the last 30 years man-made corridors in the form of wildlife underpasses and overpasses were built across this major transportation corridor. 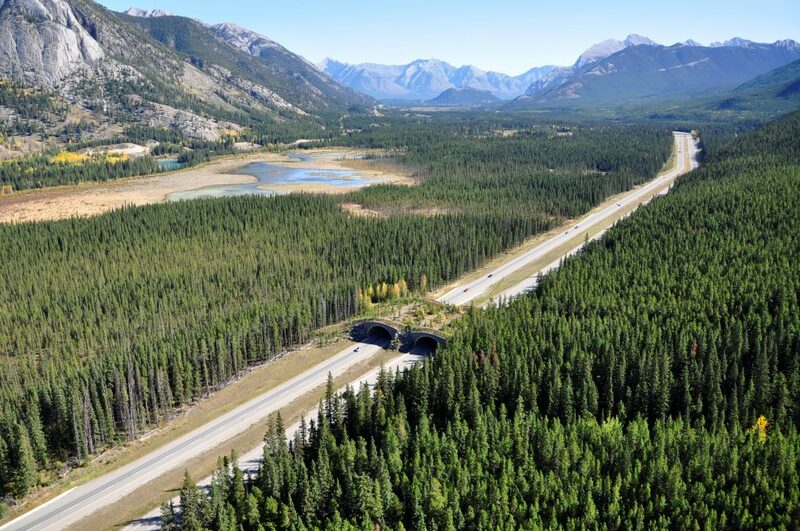 Currently there are 40 man-made corridors for wildlife consisting of 4 different designs along 83 km of the TCH in Banff National Park. To date, research has detected 11 species of large mammals using the structures more than 200,000 times. Mortality has been reduced by greater than 80%. Grizzly bears, moose, wolves, elk and deer show a greater tendency to use large crossing structures including wildlife overpasses, while cougars and black bears tend to use the opposite – smaller more constricted underpass structures. 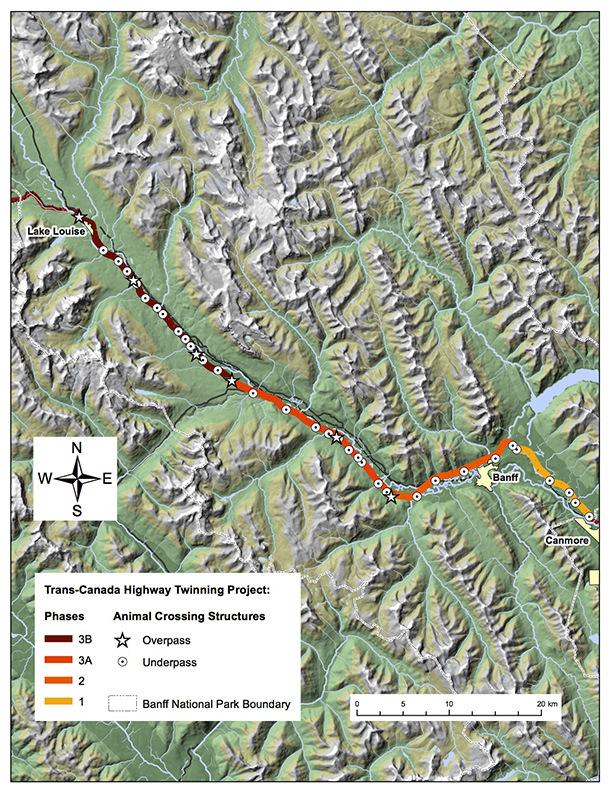 Population-level research using noninvasive genetic sampling detected significant proportions of grizzly and black bear populations using the passages, therefore providing spatial and temporal connectivity for grizzly and black bear populations in Banff National Park. To date, the Banff research is recognized by transportation, wildlife and land management agencies as a leading source of information for the field of road ecology, providing science-based guidance for resolving highway-wildlife conflicts throughout North America and abroad. Ford, A. T. and A. P. Clevenger. 2010. Validity of the prey-trap hypothesis for carnivore-ungulate interactions at wildlife-crossing structures. Conservation Biology 24:1679-1685. Clevenger, A. P. and Sawaya, M. A. 2010. Piloting a non-invasive genetic sampling method for evaluating populatin-level benefits of wildlife crossing structures. Ecology and Society 15:7.